Family Mediation is a highly cost and time effective method of resolving all disputes in relation to both Financial arrangements and child arrangements upon relationship breakdown. Lawyers from Surrey legal firm Venters have been holding weekly free advice sessions at the surgery in Warlingham since 2007. Headed by June Venters QC, they include specialists in family law and mediation. Family Mediation is a highly cost and time effective method of resolving all disputes in relation to both Financial arrangements and child arrangements upon relationship breakdown. Mediators are skilled professionals who are both qualified, and experienced, to provide a safe environment to discuss, explore, reality test and successfully reach a set of joint proposals that can go on to be made legally binding should the parties wish. The process is impartial, voluntary and confidential. Accredited Mediators provide legal information and manage the process to enable the clients to make informed decisions that make sense for themselves and their families. Most arrangements are more effective if they are agreed upon rather than imposed (e.g. by court order). Family relationships continue, particularly where there are children, long after separation/divorce arrangements have been made. If those relationships are to stand the test of time the more co-operation that exists between the adults, the greater the prospect of success. You may no longer wish to remain married or live together but that doesn't mean to say you can't be helped to achieve agreement about the future which will work best for your children and you. In 2006, June Venters was appointed Queen's Counsel in recognition of her experience and expertise as a lawyer including in the field of family law. There has been no similar appointment before or since and anyone considering using our mediation services can take comfort from the public professional recognition of the standard to which she and the team of mediators she leads aspires. Unlike many Mediation Practices, all of our qualified mediators are authorised to provide both privately funded and Government funded, legally aided mediations. Unlike only privately funded mediation services not only have all our mediators passed the additional and rigorous external tests necessary to undertake Government Funded work but this Practice has also satisfied the Government agency, known as the Legal Services Commission that we have the quality and administrative procedures in place to satisfy the superior quality standards demanded by the Government, something not all mediation providers are able to offer. As evidence of the Government approval, our Practice receives, in January 2011, the Solicitor General and the Legal Aid Minister both visited our Advice and Mediation Surgery which we run from a GP's surgery in Warlingham, Surrey. This is a 'walk in' surgery where you are able to meet June Venters QC on a Monday evening between 6-8pm who is able to provide FREE legal advice and mediation information. "Lawyers from Surrey legal firm Venters have been holding weekly free advice sessions at the surgery in Warlingham since 2007. Headed by June Venters QC, they include specialists in family law and mediation." 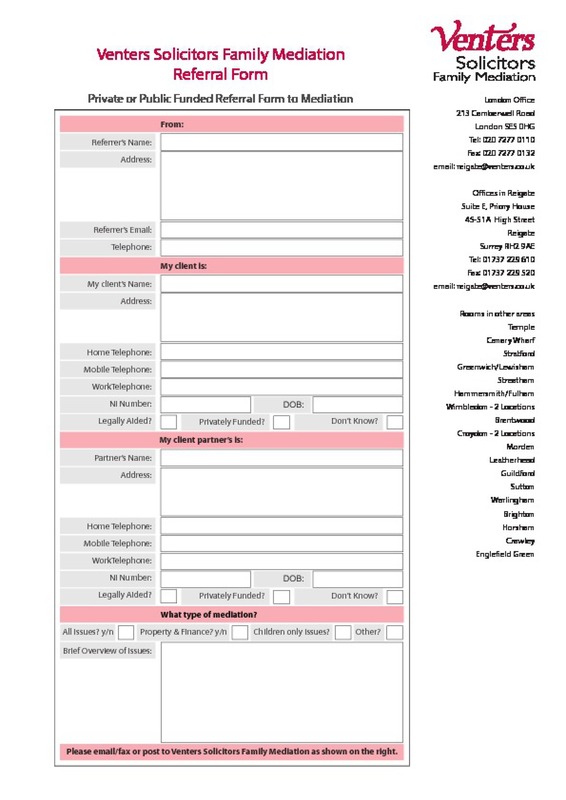 If you wish to use our services please download our Mediation Referral Form using the button on the right. Please complete this and fax or post back to us. Alternatively, if you want to learn more about our services and would like us to contact you please fill in our on-line contact form and we will call you at your convenience.